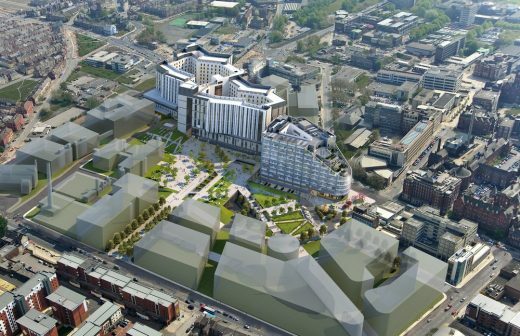 Clatterbridge Cancer Centre has been granted planning permission by Liverpool’s planning committee. The Clatterbridge Cancer Centre NHS Foundation Trust is one of the largest networked cancer centres in the UK. Combining world-class clinical services, research and academic excellence, the new centre will provide the highest quality, specialist nonsurgical oncology treatment and care for the wider region. 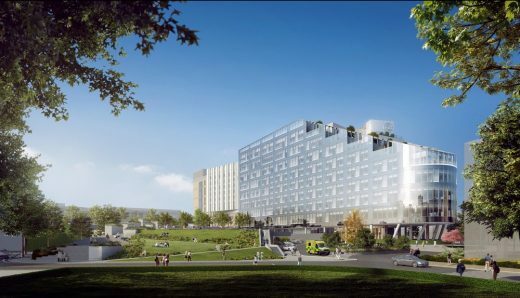 The building, expected to open in the summer of 2019, will be located on the Liverpool Health Campus alongside the Royal Liverpool Broadgreen University Hospital, the University of Liverpool and other key research partners. A particular feature of the building is the set-back cantilever form over the entrance and the sunken landscape court. The building also steps back in profile to provide external terrace space to wards and the chemotherapy floor, with spectacular panoramic views across Liverpool. In contrast to the adjacent RLBUH building, the elevation has a variety of transparent, translucent, opaque and graduated fritted panels in a unitised cladding system which all sit on a more substantial stone plinth at street level. The main entrance and reception facilities will create an active frontage to the public realm, and contain a large atrium space to bring light down to this level creating a dramatic entrance space of civic quality.